Great to see Defoe back in this classic cover! 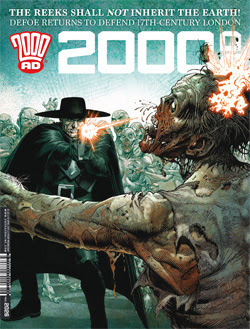 Defoe returns, and although there’s no Defoe in this issue, we do get the Reeks! We get a nice build up to their appearance with some kids talking about the different Reeks from the ‘Penny Dredfuls’. the build up to the appearance is really well done, as is the art! Bridgit continues her investigation, and although the investigating the ‘why’ is not strictly in her remit, she wants to get to the bottom of it all before she starts building up. This is a sound reason, but we get the impression that it’s not the only reason. She also meets up with the current head of security at the development, and while it seems they are butting heads, it also looks like he’s hiding something. The problems build up with a visit too! We get an opportunity here – to discover some of the origins of the Martians. Their history is still confused and the origins of all their battles are unknown (or forgotten) but we do get a way forward. It may not be the best way, but it seems like there is going to be some serious soul-searching going on! The problems for our rogue Judge and compainion seem to be bad ones, but perhaps not in the way that we thought. Of course there are others – and as you would expect, they are not happy with the Judges. We also get a flashback to the academy, and the way the soon-to-be Judge Death was – creepy!